The cloud is an essential part of your business, but hidden challenges to building and sustaining a cloud architecture at scale may undermine your success. Cloud architectures must be highly flexible, operate at velocity, and offer always-on resiliency while operating at the scale modern enterprises demand. 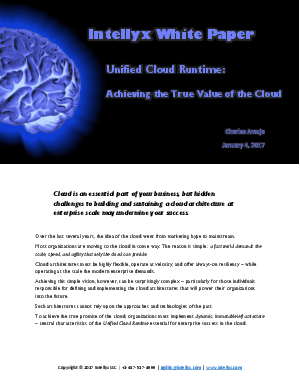 To achieve the true promise of the cloud, organizations must implement dynamic, immutable infrastructure via a Unified Cloud Runtime. This paper details that approach to cloud's complex challenges and how an extensible, infrastructure-level cloud operating system like Fugue fits the bill to realize success.